Onoda, S. (2014). Examining the relationships between self-efficacy, effort regulation strategy use, and English vocabulary skills. Studies in Self-Access Learning Journal, 5(4), 357-371. This study explores the relationships among self-efficacy beliefs, effort regulation strategies, and English vocabulary development at a university in Japan. The theoretical framework draws on Pintrich and Zusho’s (2002) model of self-regulation, motivation, and academic success and Bandura’s (1986) social cognitive theory. Educational psychology literature indicates that self-efficacy beliefs predict self-regulation strategy use, and that self-efficacy beliefs and self-regulated learning are two of the most important predictors of a learner’s academic success (Bandura, 1986; Pintrich, 2004). Although a large number of studies have been conducted in general education, there has been limited research on this topic in the Japanese university English education context. In order to examine the relationships between learners’ self-efficacy beliefs, effort regulation strategy use, and English vocabulary skills, the present research focused on English majors at a Japanese university. Data were collected using a questionnaire including items that measured self-efficacy and effort regulation strategies, and Nation’s Vocabulary Size Test (2001). The data were analyzed employing structural equation modeling in order to highlight clear relationships among these variables. The results indicated that self-efficacy predicted effort regulation strategies use, which in turned influenced L2 vocabulary skills. Developing self-regulated learners who can manage their learning effectively—with clear goals, high motivation, and self-efficacy—is important for success in foreign language learning. This is especially the case for diverse English as a Foreign Language (EFL) contexts (Oxford & Lee, 2008). It is well documented in educational psychology that self-regulation has profound effects on academic achievement and that self-efficacy influences self-regulation strategy use, which in turn predicts academic achievement (Pajares & Schunk, 2001). However, although the importance of self-regulation has been documented in L2 literature in the last decade (e.g., Tseng, Dörnyei, & Schmitt, 2006), findings on factors that facilitate self-regulated language learning and the relationships among variables that predict L2 achievement are still in their infancy, and the findings are rather limited. Thus, it is empirically and pedagogically valuable to explore such relationships in L2 skill areas. Research from within educational psychology indicates that self-efficacy is an important predictor of academic learning (Pintrich, Smith, Garcia, & McKeachie, 1991, Pintrich & Zusho, 2002; Zimmerman & Martinez Pons, 1990). Self-efficacy refers to learners’ judgments of their abilities to complete a specific task successfully (Bandura, 1986; Paulsen & Gentry, 1995; Schunk, 1996). Self-efficacy was derived from Bandura’s social cognitive theory (1986), which states that individuals develop perceptions of their own capabilities in performing a task. These perceptions influence the pursuit of goals, degree of motivation and task persistence along with selection and use of strategies. Self-efficacy has been reported to have a profound impact on academic achievement, and self-efficacious learners tend to anticipate successful results, engage in difficult tasks, and maintain their commitment to learning, which typically results in positive academic outcomes (e.g., Paulsen & Gentry, 1995; Pintrich et al., 1991; Zimmerman & Bandura, 1994; Zimmerman & Martinez-Pons, 1990). Schunk (1985) and Zimmerman and Martinez-Pons (1990) have demonstrated that students with high efficacy are likely to use more cognitive and metacognitive strategies and stay engaged in those tasks more thoughtfully and longer than those with low efficacy, thereby demonstrating successful learning. Thus, self-efficacy appears to fuel motivation (i.e., a drive to instigate their learning) and volition (i.e., willpower to help learners to maintain their learning when they are faced with distracting factors), enabling learners to persist when faced with difficulties, which in turn leads to higher academic achievement. Previous studies show that self-regulation is also an important predictor of academic learning outcomes. The definition of self-regulation differs from researcher to researcher depending on their theoretical groundings, but Pintrich and Zusho (2002) postulate that self-regulation involves the learner proactively and reactively managing his or her learning processes cognitively, motivationally, and behaviorally. In the model they put forward, Pintrich and Zusho (2002) include volition as one of the essential elements in executing self-regulated learning. Empirical findings support these theoretical perspectives. Pintrich and De Groot’s (1990) study using a preliminary version of the Motivated Strategic Learning Questionnaire (Pintrich, Smith, Garcia, & McKeachie, 1993) investigated the relationship of motivational variables, including self-efficacy and self-regulation, and academic achievement of middle school students in the US. Results indicated that self-efficacy and self-regulation were significant predictors of learning outcomes, that self-efficacy was correlated with self-regulation, and that self-efficacy and self-regulation were significant predictors of academic achievement. Thus, research began to investigate the relationship between self-efficacy and self-regulation, with self-regulation seen as an intervening variable operating between self-efficacy and academic learning results. Zimmerman and Martinez-Pons (1990) reported that learners who demonstrated the use of effective self-regulation strategies and who had a high degree of self-efficacy were likely to succeed academically, indicating that self-efficacy, which helps maintain volition, appeared to promote the use of self-regulation strategies. Social cognitive views of self-regulation (Zimmerman & Martinez-Pons, 1990; Pintrich & Zusho, 2002) posit that volition is an important element of self-regulation when learners are engaged in learning activities, as is indicated in Zimmerman’s (2000) three-stage model of self-regulation (Figure 1). This model posits that self-regulated learners pass through three cyclical phases involved in the self-regulation process: a forethought phase, a volitional or performance control phase, and a self-reflection phase. According to this model, when faced with an academic task, learners set an appropriate learning goal and plan procedures and strategies. Then, when engaging in the task, their learning behavior is supported by volitional or performance control. Learners regulate or maintain their concentration, attention, and motivation so that they can efficiently learn and attain the initially determined goal. Finally, upon completion, the learners reflect on their learning outcomes, using this reflection to then help maintain motivation and sustain or improve performance in future academic tasks. The importance of volition is, unsurprisingly, even more strongly emphasized in self-regulation models postulated by volitional theorists (Gollwitizer, 1996; Corno, 2001). With these models, it is argued that in order for learners to successfully accomplish their learning goals, volition is required in addition to self-efficacy and metacognitive self-regulation. Volition is represented in effort regulation, a subset of self-regulation concerned with maintaining volition for learning until the learning goal is achieved, especially when executing self-regulation while faced with distractions such as fatigue, boredom, and tedious or uninteresting tasks. My contention is that the relationships observed in educational psychology between self-efficacy, self-regulation, and academic achievement can be confirmed in EFL learning, and that self-efficacy and effort regulation strategies are important predictors of English learning outcomes. More specifically, I hypothesize that self-efficacy predicts L2 learning, directly and through effort regulation strategy use. In the L2 field, however, investigations of such relationships are rather limited. Wang’s (2007) study conducted in an ESL context showed that self-efficacy beliefs were related to motivation for learning and self-regulated strategy use. Wong’s (2005) study with ESL learners reported similar results: self-efficacy beliefs were correlated with self-regulation strategy use, indicating highly efficacious language learners are more proactive learners, employing self-regulation strategies that suit the learning context. It is important to note that in the L2 field, the concept of self-regulation has recently been used alongside similar concepts such as autonomy and metacognition; discussions of the latter two concepts have outlined the importance for learners of setting goals, selecting strategies, monitoring learning processes, evaluating and reflecting on learning outcome, and making causal attributions (Dörnyei, 2005). While the discussions may also involve motivation, they do not explicitly include volition. Thus, it is hypothesized (Dörnyei, 2005; Pintrich & Zusho, 2002) that even if learners demonstrate good knowledge of metacognition and a high degree of autonomy, it is not evident that they can continue to manage learning when they are faced with distractions and difficulties; motivation alone may not be adequate for successful L2 self-regulated learning. Rather, as volitional theorists postulate (Corno, 2001; Gollwitzer, 1996), motivation may only help learners to initiate their learning and may not be adequate for maintaining self-regulated learning. Considering the difficulties L2 learners face, a few researchers have argued for the importance of volition in L2 vocabulary learning and developed a self-regulation model of vocabulary learning. Tseng, Dörnyei, and Schmitt (2006) developed the Self-Regulatory Capacity in Vocabulary Learning scale (SRCvoc) and attempted to measure the underlying self-regulatory capacity of learners. The instrument focused on five aspects of self-regulation: commitment control, metacognitive control, satiation control, emotion control, and environmental control. The whole measurement tool demonstrated a high reliability, indicating that self-regulation emphasizing volition is one of the most important predictors of L2 vocabulary learning. The construct validity and reliability were later tested and confirmed by Mizumoto and Takeuchi’s replicated study (2012). These studies are insightful and lend support to the importance of effort regulation strategies (i.e., strategies to maintain learning when faced with distractions) as well as metacognitive self-regulation strategies (i.e., strategies to employ metacognition in learning) in vocabulary learning and the need for investigation of the relationships among self-efficacy, effort regulation strategy use, and L2 vocabulary skills. H1: Self-efficacy directly influences L2 vocabulary skills. H2: Self-efficacy influences effort regulation strategy use. H3: Effort regulation strategy use influences L2 vocabulary skills. Figure 2 illustrates the proposed relationships between the constructs under study. Note: SE = self-efficacy; ERS = effort regulation strategy use; L2 Voc = L2 vocabulary skills. The participants in this study were 235 second-year English majors (79 males and 156 females) enrolled in 11 classes of a Media English course at a private Japanese university in 2012. Their general English proficiency was measured using the TOEFL, with a range of scores from 385 to 555, and a mean and SD of 485 and 38.55 respectively. The questionnaire to measure the use of effort regulation strategies and self-efficacy beliefs was based on the Motivated Strategies for Learning Questionnaire (MSLQ) (Pintrich, Smith, Garcia, & McKeachie, 1993). The development of the questionnaire used in this study is outlined in Onoda (2013). The original MSLQ is an 81-item self-report instrument with a seven-point scale designed to measure two constructs: motivation and learning strategies. Learning strategy items include effort regulation strategies as the representation of volition. Motivation constructs include self-efficacy for learning and performance items. The MSLQ has been translated and employed in many countries around the world and has been shown to have high reliability in measuring self-regulation strategy use and motivation of students from elementary school to university across a range of school or academic subjects (Schunk, 2005). The MSLQ items that measure effort regulation strategy use and self-efficacy beliefs were revised into those that best suit L2 vocabulary learning by the researcher and a colleague. These revised items were then checked and modified based on feedback from a group of five 4th-year students with TOEFL scores above 550 who had been identified as good language learners by their teachers. These modified items were used with a group of 60 students who were not part of the research sample, and the results were further analyzed using Rasch analyses in order to check the rating scale functioning, construct unidimensionality, and the point-measure correlations of the items. Through these steps, four items that measure effort regulation strategies and four items that measure self-efficacy beliefs with high Rasch person reliability and separation estimates (.82 and .79, respectively) and high Rasch item reliability and separation estimates (.95 and .98, respectively) were created for use in this study (see Appendices A and B). For measuring vocabulary skills, a version of the Vocabulary Size Test developed by Nation (2001) and used in L2 literature was used. A preliminary study (Onoda, 2013) indicated that this version of the test measured the passive vocabulary knowledge of English majors with a high reliability. This vocabulary test has 10 items from each 1000-word level, 140 items in total, in a multiple-choice format. The words from the 1,000 word level to the 8,000 word level were selected and used for the present study because acquiring a vocabulary of 8,000 words is a goal at the researcher’s university, and has been reported to be a goal of English majors at universities in Japan (Beglar, 2000). The effort regulation strategy and self-efficacy questionnaire and the Vocabulary Size Test were administered to 235 students in January 2014. The Vocabulary Size test data were all normally distributed, with a mean of 45.31 and standard deviation of 8.75, the skewness (.31) and kurtosis (.37) was acceptable, and no outliers were identified. The Vocabulary Size Test demonstrated a high reliability coefficient of α= .89. Given that no problem was identified with the vocabulary test data and the questionnaire data, structural equation modeling was employed in this study in order to test the causal relationships of the target variables. This statistical method allows researchers to determine which particular variables have the strongest predictive power and to determine how well the predictors explain the criterion variable (Schumacker & Lomax, 2004). Results are given in greater detail below. The research question concerned the relationships between self-efficacy, effort regulation strategies, and L2 vocabulary skills. Using data from the effort regulation strategy use and self-efficacy questionnaire and the Vocabulary Size Test scores, structural equation modeling was performed using AMOS 7.0J (Arbuckle, 2006). The correlation matrix for the latent variables is presented in Table 1. 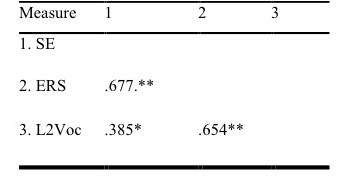 The hypothesized relationships represented in Figure 2 are generally supported by the correlation coefficients displayed in Table 1. Self-efficacy was highly correlated with effort regulation strategy use (r = .677, p < .001) and moderately correlated with L2 vocabulary skills (r = .385, p < .005). In addition, effort regulation strategy use was highly correlated with L2 vocabulary skills (r = 654, p < .001). Note. SE = self-efficacy; ERS = effort regulation strategy use; L2 Voc = L2 vocabulary skills. In the hypothesized model, self-efficacy directly affects L2 vocabulary skills (H1). In addition, self-efficacy is hypothesized to have a direct influence on effort regulation strategy use (H2), which in turn predicts L2 vocabulary skills (H3). The results indicated that self-efficacy did not directly influence L2 vocabulary skills (β = .25, p < .05). Instead, self-efficacy significantly predicted effort regulation strategy use (β = .67, p < .001), which in turn predicted L2 vocabulary skills (β = .66, p < .001). Additionally, as the fit indices indicate, the hypothesized model met criteria for acceptable model fit: χ2 (Chi-square ) 1841/235) = 7.82, p = .00, CFI = .85, RMSEA = .057, SRMR = .055. Hu and Bentler (1999) suggested that ideally at least two of the cutoff values closer to .95 for CFI, .08 for SRMR, .06 for RMSEA are needed before we can conclude that there is a good fit between the hypothesized model and the observed data. However, they also indicated that a combination of cutoff values approaching .05 for RMSEA and .06 for SRMR are considered indicative of an acceptable fit. Thus, the model was judged acceptable. The standardized path coefficients indicated that all the paths, except Hypothesis 1, were statistically significant. The interrelationships between self-efficacy, effort regulation strategy use, and L2 vocabulary skills were investigated using structural equation modeling. The results indicated that self-efficacy significantly influenced effort regulation strategy use, which in turn influenced L2 vocabulary skill development. However, the path from self-efficacy to L2 vocabulary skills was not confirmed. Self-efficacy did not directly predict L2 vocabulary skills, but it influenced L2 vocabulary indirectly through the mediation of effort regulation strategy use. This result suggests that, in addition to self-efficacy developed through previous learning experiences, learners need to know, and be able to employ, effort regulation strategies in order to control their learning behavior for successful learning. This study demonstrated that effort regulation strategy use (as the representation of volition) is important for developing L2 vocabulary skills. It also suggests that it is crucial for educators to understand the importance of learners developing self-efficacy because this can positively affect effort regulation strategy use. In order to promote self-efficacy, as Bandura (1986) postulates, teachers can help learners experience personal mastery experiences or repeated successful experiences, allow them to observe peers overcoming challenging or ego-threatening tasks and achieving success, arrange for them to receive positive feedback from significant others such as teachers, and reduce their anxiety while learning. While engaged in these experiences, learners can also learn to improve their effort regulation strategies as manifested by volition. In addition, self-regulation strategies can be taught by direct teaching (Pintrich & Zusho, 2002), and learners can discuss them with peers and the teacher, observe good learners using them, and reflect on their learning (Zimmerman, 2000). However, one should note a limitation of the present findings. The results reported do not rule out the existence of other potential models (Hagger, Chatzisarantis, & Harris, 2006) because the fit of data to one particular model does not mean that the model is the only correct one; it simply indicates that the model is plausible and has not been disconfirmed. The likelihood does exist that alternative models can be confirmed (Beglar, 2000). A theoretically and empirically based model explaining the relationships between self-efficacy, effort-regulation strategy use, and L2 vocabulary skills was investigated. Two of the three hypotheses indicated in the model were supported by the present data, indicating that some of the relationships described in the educational psychology literature might also hold true for English vocabulary learning. Self-efficacy significantly influenced effort regulation strategy use, which in turn significantly predicted L2 vocabulary skills. However, as discussed above, there is a limitation of the present findings; namely, while it is true that the data fit the present model, there are possibilities that alternative models exist. Therefore, it is desirable that replication studies using similar participants (i.e., English majors in EFL contexts) should be conducted in order to lend robust support to the results of the present study. Sakae Onoda earned an Ed. D in applied linguistics from Temple University, Japan. He is a Professor of English education at Kanda University of International Studies, Japan. His research interests include teacher education, development of listening and speaking fluency, and facilitating self-regulated language learning. Arburckle, J. L. (2006). AMOS 7.0 J. [Computer software]. Tokyo, Japan: SPSS, Japan. Beglar, D. (2000). The validation of a breadth of vocabulary test using structural equation modeling (Unpublished doctoral dissertation). Temple University, Philadelphia, PA.
Beglar. D., & Hunt, A. (2005). Six principles for teaching foreign language vocabulary: A commentary on Laufer, Meara, and Nation’s “Ten Best Ideas”. The Language Teacher 29(7), 3-6. Corno, L. (2001). Volitional aspects of self-regulated learning. In B. J. Zimmerman & D. H. Schunk (Eds. ), Self-regulated learning and academic achievement: Theoretical perspectives (pp. 191-220). Mahwah, NJ: Erlbaum. Dörnyei, Z. (2005). The psychology of the language learner: Individual differences in second language acquisition. London, UK: Erlbaum. Gollwitzer, P. M. (1996). The volitional benefits of planning. In P. M. Gollwitzer & J. A. Bargh (Eds. ), The psychology of action: Linking cogniton and motivation to behavior (pp. 287-312). New York, NY: Guilford Press. Laufer, L., Meara, P., & Nation, I. S. P. (2005). Ten best ideas for teaching vocabulary. The Language Teacher 29(7), 3-6. Nation, I. S. P., & Newton, J. (2009). Teaching ESL/EFL listening and speaking. New York, NY: Routledge. Onoda, S. (2013). Exploration of the relationships among self-efficacy, self-regulation strategy use, and English vocabulary skills. Studies in Linguistics and Language Teaching, 24, 107-125. Oxford, R. L., & Lee, K. R. (2008). The learners’ landscape and journey: A summary. In C. Griffiths (Ed. ), Lessons from good language learners (pp. 306-317). Cambridge, UK: Cambridge University Press. Pajares, F., & Schunk, D. H. (2001). Self-beliefs and school success: Self-efficacy, self-concept, and school achievement. In R. Riding & S. Rayer (Eds. ), Perception (pp. 239-266). London, UK: Ablex. Paulsen, M. B., & Gentry, J. A. (1995). Motivation, learning strategies and academic performance: A study of college finance classrooms. Financial Practice and Education, 5(1), 78-90. Pintrich, P. R. (2000). The role of goal orientation in self-regulated learning. In M. Boekaerts, P. R. Pintrich, & M. Zeidner (Eds. ), Handbook of self-regulation (pp. 451-502). San Diego, CA: Academic Press. Pintrich, P. R., & Zusho, A. (2002). The development of academic self-regulation: The role of cognitive and motovational factors. In A. Wigfield & J. S. Eccles (Eds. ), Development of achievement motivation (pp. 249-284). San Diego, CA: Academic Press. Schumacker, R., & Lomax, R. (2004). A beginner’s guide to structural equation modeling. New York, NY: Routledge. Schunk, D. H. (1996, April). Self-efficacy for learning and performance. Paper presented at the meeting of the American Educational Research Association, New York, NY. Wang, C. (2007). Self-regulated learning strategies and self-efficacy beliefs of children learning English as a second language (Unpublished doctoral dissertation). The Ohio State University, Columbus, OH. Wong, M. S. (2005). Language learning strategies and language self-efficacy. Regional Language Centre Journal, 36(3), 245-269. Zimmerman, B. J. (2000). Attaining self-regulation: A social cognitive perspective. In M. Boekaerts, P. R. Pintrich, & M. Zeidner (Eds. ), Handbook of self-regulation: Theory, research, and applications (pp. 13-39). San Diego, CA: Academic Press. Pingback: Have you ever heard of self-efficacy?